I have trusted Dr. Cough and his staff for two years now, since deciding to seek treatment for migraine headaches. I have experienced life changing improvement in my symptoms. My migraines have been reduced significantly in frequency and duration. I had suffered with sciatica and lower back pain for quite a while before going to see Dr. Cough. I found him to be sympathetic to my problems and knowledgeable as to how to fix me! I am happy to say that Ihave felt so much better since visiting his office. His staff is so friendly and welcoming. Dr. Cough was the first chiropractor I had ever visited, and after seeing him multiple times for my neck and shoulder issues, he is without a doubt the only chiropractor I will ever visit. From the welcome I received at the desk upon arrival to the educational visit with Dr. 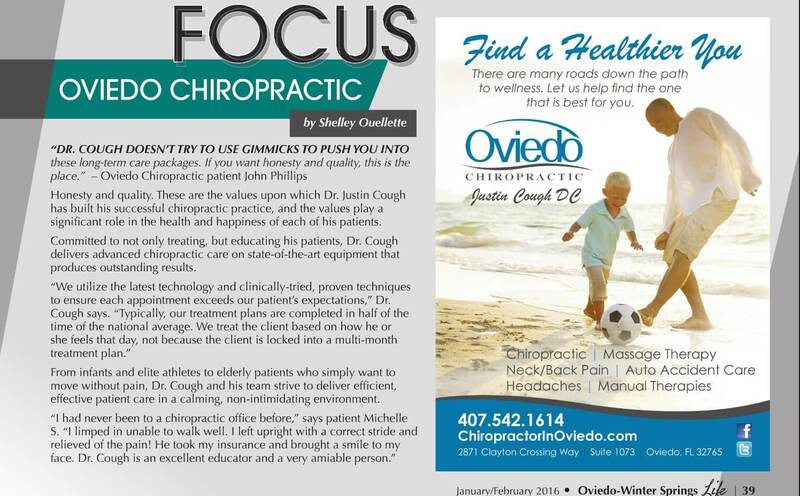 Cough I was convinced that the best choice for my family is at Oviedo Chiropractic! The staff & Dr. Cough are awesome! This is my first time ever going to a Chiropractor and this has been the best experience I’ve ever had. They are knowledgeable and accommodate your needs. I look forward every time going to my appointments.